"Natalie McLaury, happily-married blogger of The Sweets Life and running enthusiast, went into a catatonic state on the evening of April 1. Sources say she began a new, high-stress job while wrapping up previous obligations at her former rotation, all while training for a marathon, volunteering to bake 12 batches of scones for her church, and hosting five different bridal showers in the same week - a combination thought to have possibly contributed to her reported mental breakdown. She has been brought to a lovely sanitarium where she will remain in a padded cell until she makes progress with her newest condition - religiously chanting her new mantra, "Busy is better than boring." KSDK has learned that her husband has eaten nothing but cereal since the onset of her psychological woes. More to come on this developing story as updates roll in." Not the typical start to my blog posts, huh? My friend Paige emailed me the above paragraph on a day when my stress level was at an all time high. Although she exaggerated a bit on the details of my busy life, she captured its essence pretty well. Thank goodness for friends like Paige who can make me laugh at the insanity that I call my life! Because Paige's fake news story has truthful elements to it, namely the juggling of too many things at once!, I've been on the lookout lately for easy recipes. I know I'm not the only one struggling to stay on top of things whilst still getting a semi-healthy dinner on the table most nights. This asparagus recipe is for you too. Pick up a precooked rotisserie chicken from the grocery store and make this asparagus to go alongside, or add this easy but flavorful dish to your Easter menu. If you're short on time but not willing to succumb to the McDonalds drive-thru (yet), this side can help! 1. Preheat oven to 425F. 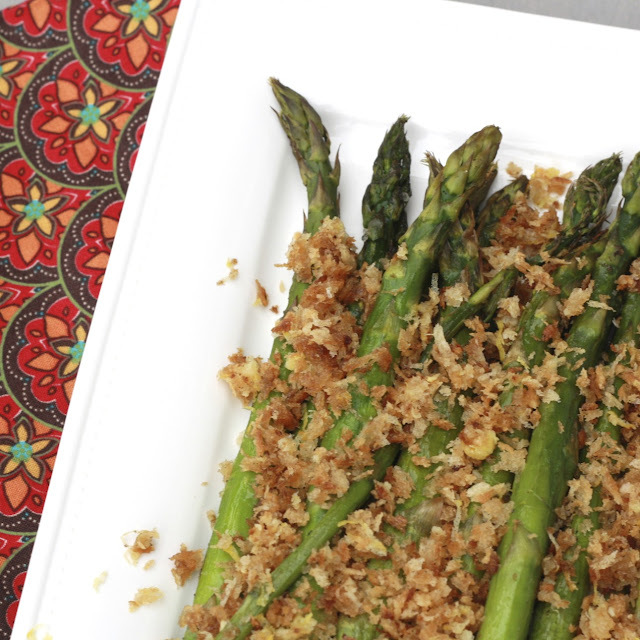 Toss asparagus with olive oil. Line in a baking dish or rimmed baking sheet and sprinkle with salt and pepper. Roast for 18-20 minutes, until tender. 2. 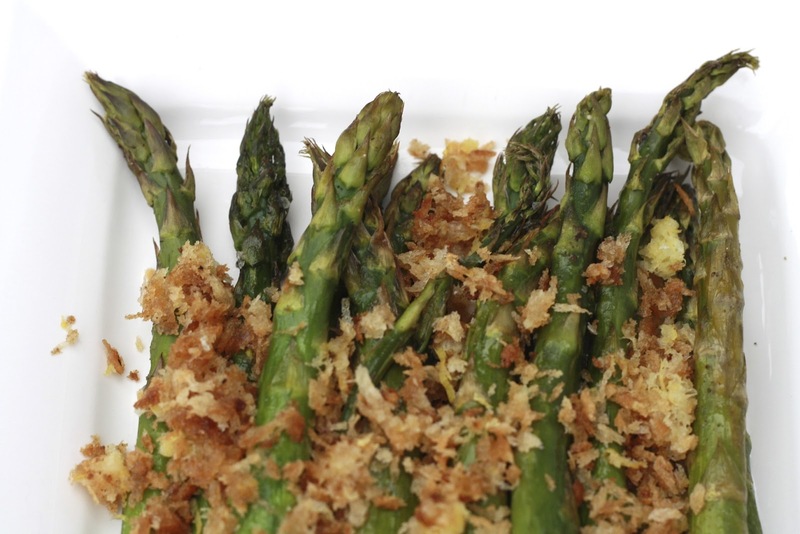 While asparagus is roasting, melt butter in a medium-sized saucepan over medium heat. Add panko and cook, stirring frequently, for 8-10 minutes, until deeply browned. Remove from heat and stir in lemon juice and zest. 3. 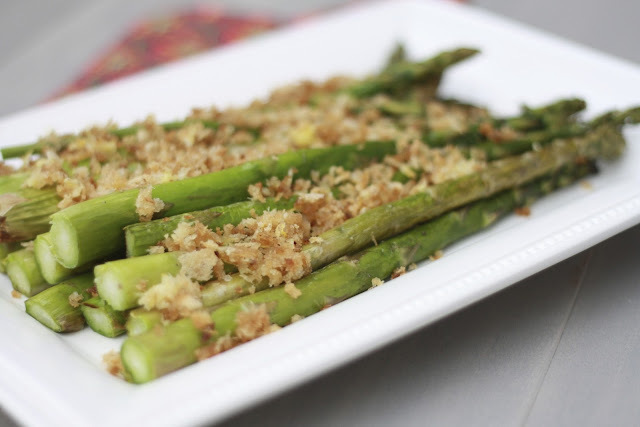 Toss asparagus with panko mixture and serve immediately. Garnish with lemon if desired.